It is established that "Minoxidil" even in its most potent strength 6%, can regrow lost hair, particularly with young me with recent loss. It can prevent further loss. Mostly effective for young men with recent hair loss. It is usually minor growth, which doesn't tend to develop past the intermediate stage. Added to that, time has shown that the benefits of Minoxidil wear off after two to three years of continuous use. In short, the treatment is useful to help take the pressure off young men, suddenly facing hair loss. Allowing them more time to come to terms with the problem. Most Clinics offer a range of "additives" to the basic Minoxidil therapy. Progesterone and Tretinoin or a combination of both. Or a combination of both. Progesterone, is an anti-androgen, purported to block the formation of the male hormone, testosterone, in the scalp.. This allows the Minoxidil to have more effect. Tretinoin – a derivative of Vitamin A is used as a "vehicle" allowing the Minoxidil to penetrate the scalp more effectively. These are topical solutions applied to the scalp and consequently, they remain 'localised' in the target area, rather than being absorbed into the main bloodstream unlike Finasteride, which is taken orally. To those unfamiliar with Finasteride, here is a short history. Finasteride is a drug which began life as a treatment for prostate cancer. As is occasionally the case with newly developed drugs, Finasteride was found to have a beneficial 'side-effect', totally unrelated to the drug's intended use. During the drug's initial clinical trials, it was soon realised that a considerable number of men being tested who were bald or had balding areas, showed initial signs of growing some of their hair back. In 1997, 6 years after the manufacturers initial discovery, The FDA (America's Food & Drug Administration) licensed the drug for use as a hair growth treatment in the US. One could ask why, knowing Finasteride potential for growing hair, the manufacturers limited their clinical trials to only 12 months? Could it be that, had they extended the trials, they would have had to admit that their drug too, has limitations? In our experience, no one has re-grown significant volumes of new growth to consider it to be a complete hair loss solution. Yes, Finasteride can prevent further hair loss and does so for something like 84% (published) of users. Yes, it can improve the 'volume' and lustre of their existing hair. It can also produce the first signs of new growth, but this growth tends to remain fine in texture and short in length. Such growth amongst a man's existing hair, the fine, short growth which achieves its original pigmentation, rather than remaining velus (translucent) gives a much-improved appearance to the overall 'look' of his hair. Unfortunately, to apply similar results to a bald scalp would appear insignificant. Therefore, the way one views Finasteride success depends greatly on one's current state of hair loss. To men who are just recognising the first, subtle signs of oncoming hair loss, Finasteride is all that's required to ensure them of a hirsute future. That is, for as long as they continue its use. Stop taking the pill after a few years and all the hair the man has prevented from falling out will simply disappear. There are those, of course, who are simply happy to maintain the 'status quo'. They can live with their hair loss as it stands but are unhappy at the thought of it getting any worse. These men too would value the treatment, especially if it improved on the overall appearance of their existing hair. Finally, there are those who have lost some, but not all of their hair. 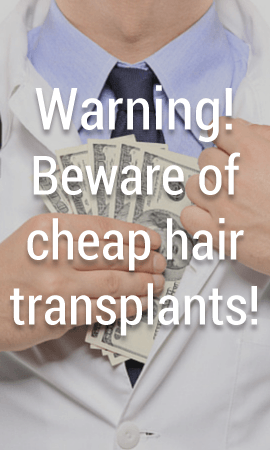 They opt for hair-growth treatments, hoping that they are among the rare cases of 'total re-call' we occasionally see on television documentaries. Then, having likely narrowed the gap between what they had and what they wanted, they, as I have, opt for Hair Restoration Surgery to achieve their goal knowing that they do not face losing more hair once the surgery is completed. In clinical trials, finasteride was very well tolerated in men, with most patients reporting no serious side effects. The principal side effects associated with finasteride were decreased libido (1.8% of finasteride patients versus 1.3% on placebo) and erectile dysfunction (1.3% finasteride versus 0.7% placebo). In addition, decreased volume of ejaculate was reported in 0.8% of men treated with finasteride and 0.4% of those on placebo. All of these side effects resolved upon discontinuation of therapy, and also resolved in many men who preferred to continue therapy. Finasteride is not indicated for use in women or children. Finasteride is contraindicated in women who are or may potentially be pregnant. Finasteride is contraindicated in patients who are hypersensitive to any component of the product. Studies have been conducted with Finasteride and Antipyrine, Digoxin, Glyburide, Propranolol, Theophylline, and Warfarin, and no interactions were found. In clinical trials, Finasteride was used concomitantly with ACE inhibitors, acetaminophen, alpha blockers, benzodiazepines, beta blockers, calcium channel blockers, cardiac nitrates, diuretics, H2 antagonists, HMG-CoA Reductase inhibitors, prostaglandin synthesise inhibitors (NSAIDs), and quinolones, without evidence of clinically significant adverse interactions. I have heard that a combination of Finasteride and Minoxidil may be the best solution for male pattern hair loss. Is this true? There are no human data supporting the use of this combination. Scientific studies would be required to assess the safety and efficacy of such a combination. At this time, no combination studies are planned.